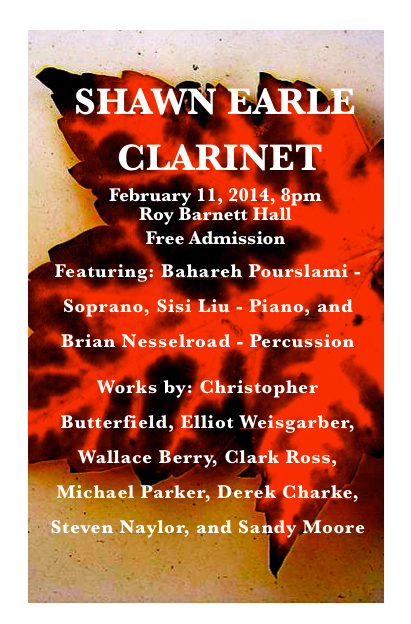 My second DMA recital will be Feb. 11 at 8pm at the Roy Barnett Hall at the University of British Columbia. I will be joined by Sisi Liu on piano, Brian Nessleroad playing percussion, and soprano Bahareh Poureslami. This will be an all Canadian programme featuring works by: Christopher Butterfield, Elliot Weisgarber, Jordan Nobles, Wallace Berry, Michael Parker, Clark Winslow Ross, Derek Charke, Steven Naylor, and Sandy Moore. The first half will be works by British Columbia composers. The second half of the recital will be works by composer from the Atlantic region.